A hazy blue white beam of light sliced through the gloom of the interior of the Corinthian. "This is a weird ship." Ensign Katherine Rogers noted with a sigh as her and Haldo Compz stumbled down the spine towards the tiny shuttle bay that had so far eluded them. "You’re telling me?" Haldo sighed back. "I’ve tried everything and I just can’t get the lights to work in this section." "They were on earlier." Katherine shrugged. "What happened?" "Blake Girling was awake earlier." Haldo shook his head in dismay. "The systems are so dependent on his neural patterns that the ship is virtually a reflection of his state of mind." "I hear that most of the corridors are totally exposed to space where the armour wasn’t finished." She noted to make conversation in the hope it might distract her from her growing apprehension as they carried on with the torchlight feeling its way through the shadows. "From what I can make out the ship saw itself as a whole when it initiated." Haldo explained. "It noted the missing hull plates and the computers assumed it was meant to be that way so just sealed everything in with force fields." "How reliable are they?" Katherine asked, hoping for reassurance. "Apparently they’re every bit as reliable as solid matter." Haldo told her. "I will still make a point of remaining close to an escape pod for as long as I’m aboard." Katherine held up her tricorder and waved it around the corridor scanning for power signatures. "Detecting anything interesting?" Haldo asked, stopping to access an information panel. "Nothing that explains why there are no lights on!" She replied grumpily. "This ship is trying to be a replica of Blake's mind, at least as far as it perceives him." Haldo commented absently. "When he’s asleep parts of it shut down." "I guess Blake's mind is not used to having a crew on board." She smiled thinly and without humour. "It could be worse." Haldo noted dryly. "At least life support isn’t compromised. I think that given enough time I can bypass most of the systems and make the ship work more or less properly." "How much time would you want to spend on this ship?" She shuddered slightly. "After the Wanderer this place is easy." Haldo smirked with his thin leather lips stretching uneasily across his pale face. "Life support gave up every month, usually a week after pay day when the systems failed because Captain Graves had sold parts of the ship to pay the crew." "I still can’t get my head around the concept of being paid." Katherine chuckled to herself. "It’s a different life to Starfleet." He told her. "We dealt with lots of other races, you needed something to exchange. Of course your food and transit was free, I saw the pay as an excuse to interact with new people." "I sort of see." She nodded with an awkward smile. "In Starfleet you only get to meet ambassadors or rescue people with failed ships, kind of like the Wanderer." Compz noted, slamming the access panel closed in irritation that he had failed to get the lights on. "I got to meet ordinary people, traders and other space-fairing merchants. It was more diverse and the life suited me." "Now I’ve hurt Section 31 and wound up on the skeletal form of an experimental spacecraft." He replied thoughtfully. "I would say I have good cause to re-evaluate my life!" Blake Girling stood at the heart of the bridge. The Corinthian spread out before him, a part of him, an echo of his thoughts and fears. He stood alone in silence at the centre, just watching the spiralling controls, the stars as they lazily drifted by and felt the almost imperceptible vibrations of his ship. The edges of the room seemed hopelessly distant, and a white fog came broiling around him, almost unnoticed as he remained motionless at his station. The consoles in front of him were churning with information, data flashed at incredible speed at every interface as the entire Starfleet, Section 31 and captured Borg databases flooded into one. Suddenly the screens froze with a bleep and all showed the Starfleet symbol. He knew something was wrong, a chill traced its way down his spine, pricking softly at his senses like a dangerous secret that swelled with as much threat as mystery. He turned slowly behind him, the eerily distant sounds of rushing wind robbing him of his balance, he staggered slightly, unsure of himself, wondering for a moment where he was as his mind filled with confusion. Within the grim shadows was a broiling fog, clouds of thick, acrid smoke billowing from nowhere. The dim tendrils of vapour coiled around themselves, hiding their inner machinations from his expectant gaze. He felt anger, the need to attack. His mind lit up, his muscles suddenly tensing in anticipation of something that he could still not quite perceive. He tried to step forward, to confront the clouds but his feet wouldn’t move. He glanced down to where a metallic tube had coiled itself around his ankle. Another snaked suddenly out and clasped his upper arm, pulling him back and holding him tightly in place behind the Captains chair. He growled as he struggled with all his strength but the ship held him tighter, firmly locking him in position at the command post. A figure stepped from the clouds. Red and blue blinking lights flashed over its body as a beam of red light cut instantly from its head. 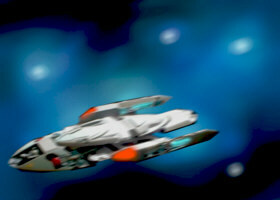 Blake watched in silence, his temper soaring as a Borg drone stepped towards him. His eye was dead, locked forward and glassy, lacking emotion or reason beyond the mechanical functioning of its imposed purpose. It’s left arm was entirely mechanical, black tubes running the length of it’s dark metallic finish while the right drew up, balling its mostly humanoid fist as if to threaten him. Blake pulled helplessly at the hoses that restrained him, his anger driving him to try ever harder against his helplessness. The drone stepped to face him, his right hand tightly clenched as two assimilation tubules began to snake slowly from his implants. Blake could only watch as the drone punched the tubules into his neck, plunging the animated metal hoses painfully into him, piercing his flesh and veins effortlessly. He winced in agony as the tubes fumbled around inside him, carelessly rummaging for his main arteries to eject a stream of nano-probes designed to rob of him of his individuality. Blake opened his eyes and stared defiantly at the one human eye of the silent drone. Their glares were locked together, hatred and pain faced the cold apathy of function as Borg poison continued to flood his body. The drone stepped back suddenly. It glared at him, it’s eye glancing around as if in fear, for once unsure of the righteousness of the role. Its deathly white pallor began to fluctuate as its cranial implants began to spark slightly. The lights around its armour winked out as the drone staggered backwards, reeling for support as it fell to the floor, blood gushing from its assimilation tubules. With a silent scream his mouth lolled open, brilliant blue light erupting from its mouth and eyes. Blake woke with a jump. He shook his head, glancing around to gather his thoughts and gain his bearings. His heart was thumping in his chest and his breathing was laboured as the lights in his tiny quarters began to automatically flick on. "He’s woken up!" Haldo noted solemnly as the lights suddenly lit up the corridor and the red alert klaxons sounded around the ship. "Red alert?" Katherine’s eyes widened in horror. "Just another bad dream." Haldo shrugged as the klaxons shut off and the red lighting returned to normal. "Oh." She nodded, remembering the time two days ago when Blake had experienced a vivid depiction of a gigantic tube swallowing up crewmen as they were sucked off the ship. Three of the twelve Wanderer crewmen had been in the holodeck when that had happened and were now on powerful tranquillisers. "I’m detecting targeting scanners being activated across the ship and four different kinds of defensive shield have just been activated, one seems to have just invented itself especially for the purpose." Haldo noted. "I guess this was a bad one." "He’s really suffering." Katherine sighed helplessly, inwardly berating herself for not being able to do more in her medical capacity to help him. "He’s making sure the rest of us join him." Haldo smirked with an unpleasant expression that showed of a number of his flat yellowing teeth." "It’s not his fault." She huffed, jumping to his defence. "That seems to be the general rule aboard this vessel." Haldo grumbled. "Yesterday the engineering console attacked me when I tried to run a diagnostic protocol." "Attacked you?" She asked in surprise. "The computer told me that everything was functioning but I wanted to check for myself." He explained. "When I tried to begin the scan a tube picked up a hyper-spanner and threw it at me." "Really?" She smiled, wondering if he was making things up. "Captain Graves had his entire supply of Gin recycled after the ship apparently disapproved of it." "Perhaps the ship just recognised it as a superior form of fuel!" She suggested. "Maybe." Compz agreed with a wry smile. "I think Graves would be safer drinking anti-matter anyway." "I think I should go and see Blake." She said with a sigh, dropping her tricorder to its holster. "You like him, don’t you?" Compz said with a tiny playful grin. "Of course." She replied uneasily. "I mean you really like him." He continued. "In a Human, chemical kind of way." "I don’t know what you’re talking about." She replied bluntly, hoping to quell the conversation. "I mean I think you see him as a potential mate for the purpose of reproduction." Compz explained. "Or recreational mating if you prefer that." "I know what you mean!" She snapped uneasily, her face flushing with embarrassment while she inwardly wished the lights would flick out again. "I mean that I don’t know where you get the idea from that I’m interested in him." "The way you look at him, the way you make excuses to spend time with him, the way you apologise for his failings to which you are generally blind…"
"Enough!" She told him with an awkward smile and forcefully enough to let him know she meant it. "Don’t worry, your secret is safe with me!" Haldo told her. "You should be careful though." He told her firmly as he snatched up his tool box. "Many Captains claim that they have no time for relationships of a personal nature as they are virtually married to their ship." Haldo explained. "In this case the ship appears to feel the same way!" Admiral Taloc Bruss quietly reviewed the information on his terminal at Starfleet command headquarters at San Francisco on Earth. "It makes for interesting reading." Joseph Reader noted while he solemnly sat opposite, tapping his chin thoughtfully. "This is everything Blake Girling sent us from the Section 31 prototype?" Bruss asked having barely managed to scan the index and sub-headings in the many hours since the report had been handed to him. "Apparently Section 31 tested the capacity of the prototype computer by downloading every single gigaquad of data they’d ever accrued." Reader nodded, his mind filled with thoughts of Starfleets arch nemesis finally falling. "There appears to be no data concerning the prototype itself." Bruss sighed. "Unless I’ve missed it. I’ve been going through the lists for nearly thirteen hours and have barely scratched the surface." "You could spend your entire life going through these files and never scratch the surface." Reader smiled. His absently turned his head to the window and watched a bird as it flew effortlessly through the unbroken crystal blue sky that hung above the bay. "We need to arrange a team to go through the data." The Admiral sighed, leaning back in his chair and knotting his fingers behind his head. "It won’t be easy selecting the right people." "That’s the least of our troubles." Reader mumbled. "What do you mean?" Bruss raised his eyebrows, his interest piqued and his thoughts coming slowly from the exhaustion of too many hours spent exploring file notes. "I don’t think Girling trusts us!" Reader replied, rubbing his face wearily. "He’s deliberately not sent us the specifications of the prototype and is not offering to hand over the ship." "According to the covering document he believes the Federation has been infiltrated by Section 31 agents at its very core." Bruss reminded his assistant. "He’s been the recipient of some very solid evidence for his claims." "I believe we should act immediately to contact him directly." Captain Reader Suggested forcibly. "The longer we leave things the longer the Section 31 factions will have to hide or even recapture the prototype." "Where would they hide?" Bruss asked with a wry smile. "We already have fleets of ships investigating every known base they’ve used in the last twenty years." "That still leaves us Blake." Reader sneered. "He’s a rogue element in control of one of the most dangerous weapons ever built." "That would be a subjective opinion!" Admiral Bruss smiled wearily, leaning forward to his terminal. "There are reports here of cloaked missiles that can obliterate entire solar systems. There are psychotronic beam weapons that can totally disrupt humanoid brain functioning temporarily or indefinitely even through a fully raised shield, chemical elements that draw subspace energy and create massive chain reactions that are as dangerous as anti-matter." "There are defences against that kind of equipment." Reader breathed heavily. "So far we’ve been invaded twice by Borg cubes, each time a single vessel has nearly wiped out our entire fleet." "We won." Admiral Bruss noted with a slightly upturned lip that approached a smile. "Against a single ship!" Reader noted. "The Borg don’t usually attack with a single ship, we’ve been nothing more than lucky." "It’s been nearly a week since we sent the message to Starfleet command." Blake commented as he sat at the briefing room at the rear of the large pointed bridge citadel. "I guess they have a lot to sift through." Ensign Katherine Rogers suggested with a shrug. "I don’t think you have much to worry about, you would have got their attention." "How much longer are you expecting to stay out here?" Haldo asked, nudging his tool box across the desk with his long fingers. "We’re waiting for them to get back to us." Blake offered apologetically around the room at the expectant faces. "My boys are getting restless." Captain Graves added. "These quarters are very cramped, there isn’t room for all of us." "This ship was never designed to function in space for long periods of time." Dr. Harold Jones explained. "She was designed to test technology and equipment, that was all." "You’re telling us?" Compz grunted. "The chassis is crammed full of experimental technology, you can hardly walk down the corridor without tripping over some device I’ve never heard of." "She’s not even properly armed." Commander Morrow added, beginning to feel largely redundant. "She has no rear weapons and we can’t find the shuttle bay." "I went looking again this morning." Compz agreed. "We know there’s a type 6 shuttle in here somewhere but no luck so far in finding it." "How comes?" Winston Morrow asked, finding the suggestion as baffling as it was ridiculous. "I presume you had some tactical training?" Compz turned his attention to Captain Girling. "Yeah." He agreed with a slightly confused nod. "Part of that training involved not revealing all of your advantages at once?" Compz persisted. "Are you saying that the ship is following his attitude of keeping some tricks up its sleeve?" Katherine asked with some reservations. "Every time I follow the map it leads me to an airlock that’s been primed for emergency ejection." Haldo grumbled. "Maybe the ship just doesn’t like you." Blake suggested with a smile. "I’ll bear that in mind next time I’m near an emergency hatch." "Why hasn’t the ship got any rear mounted weapons?" Katherine asked, spinning to face Dr. Jones who had designed much of the layout. "We fitted the advanced equipment to test it. She wasn’t anywhere near ready for combat tests." He replied, rubbing his chin in annoyance at being blamed for doing his job in a thoroughly competent manner. "The exposed sections of the ship contain Borg technology." Blake spoke, plunging the room into silence. "They’re capable of emitting pretty much any energy field including phasers." "No they’re not." Dr. Jones muttered. "Yes." Blake insisted. "They are!" "My quarters are exposed to space." Commander Morrow added. "I slept last night in a completely unplated section while the ship drifted around a nebula containing charged ions…"
"How long will we have to wait until we can go back to the Wanderer?" Captain Graves smirked at his first officer." "We’re all going to need to be debriefed." Blake told him. "We need to be thoroughly checked out medically too." "I’m certain we’re all fine!" Katherine assured him as if the suggestion was some kind of personal slight. "Me too!" He agreed with a smile. "But there may be things we still don’t know." "I’ve made some inroads into fixing some of the problems." Haldo began. "Problems?" Blake asked, turning to his appointed chief engineer. "Problems like your bad dreams chasing people around the holodeck!" Compz suggested. "It’s just a question of time before the ship replicates holo emitters throughout the hull and your nightmares begin eating the crew!" "I’m sorry about that!" Blake sighed, leaning back to the rear wall. "Nobody blames you!" Katherine assured him with a warm smile while she edged forward until remembering that Compz was watching her. "Crewmen Larch does." Commander Morrow told them. "He’s taking tranquillisers round the clock, hasn’t slept in three days and keeps calling me, ‘Mum’"
"Apparently he’s terrified, we’ve had to move him to the sick-bay as it’s the only spare place with walls." Graves smiled. "I’ve found a sensor glitch too." Compz added as he suddenly remembered the one real reason he’d bothered to attend the meeting. "A glitch?" Blake asked frowning. "I’m not detecting any glitches!" "The computer says there aren’t any but I’m detecting this ship at a separate location." Compz told him. "Three times now I’ve had sensor echoes of our own warp signature." "I didn’t see them!" Blake said firmly. "You wouldn’t have." Compz grinned. "You were too busy trying to kill us with monsters from your Id." "The computer says there’s nothing wrong?" Dr. Jones asked with some interest. "The computer attacked me with the heavy end of a spanner." Compz told him flatly. "We’re not on the best of terms at the moment." "We need to analyse the computer to look for bugs." Blake replied with a sigh. "Where do we get one?" Captain Graves shrugged, enjoying every second of his adventurous new lifestyle. "The Wanderer?" "The Wanderer computer couldn’t tell us why the door handles squeak." Compz closed his eyes and shook his head in dismay. "We don’t have any door handles." Commander Morrow said thoughtfully. "We don’t have any undercarriage either." Blake sighed. "And she’s meant to have pulse phasers fitted to the inboard section of the nacelles. Admiral Bruss looked up sharply as his door slid open, his guest unannounced. "Sir." Captain Joseph Reader said apologetically. "We have something of a situation." "This better be good, Joe…" He grinned at his assistant. "Not exactly." He replied coldly with a face that held a note of stony severity, his grey eyes peering forward with something churning away behind that simply had to come out. "Sit down." The Admiral told him, leaning back in his opulent chair from the spiralling files from the Corinthian. "Sir." He replied, all shreds of their easy familiarity vanishing as he did so. "Your team has been charged with examining the situation with the renegade prototype." "I already know that!" He agreed with a nod. "Well the situation has changed." He explained. "The prototype has been downgraded in favour of a new priority mission." "More important than this ship?" He smiled as if he found the suggestion ridiculous. "I’m afraid so." He agreed. "I thought you believed that recovering this ship was the most important thing in the known universe." Admiral Bruss baited him. "I still do." He nodded. "I don’t believe that we can or should trust the intentions of the man, Girling and recovering the prototype from him is still vital." "What has happened?" The Admiral asked calmly. "The Violator sir." He said softly. "The Starfleet intelligence vessel that Girling was found by." "It’s gone rogue, Sir!" He said with a frown. "They’re refusing our commands to return to dock for court martial investigation." Blake stood in the small holo-deck fighting down his furious temper while a small ball bobbed annoyingly in the distance. "Just take it easy!" Katherine told him. "I am!" He snapped. "It’s just not working!" "Maybe it simply doesn’t work any more." Haldo suggested with his arms crossed over his chest, flanked by the motionless figures of the two other dead federation officers who had been the recipient of Borg inspired federation technology. "You fired a phaser beam from your palm once, you must be able to do it again!" Katherine told him, dismissing Haldo’s bleak assessment. "I’m trying." Blake told them both. "I don’t know what I did before, I just raised my hands and the beam came out." "You were angry." Haldo told him. "I’m angry now." He glared back at the massive alien Human. "Just for a pleasant change!" Haldo grinned sarcastically. "What is this all about?" Girling turned to the young Ensign. "I just can’t seem to control my temper like I used to." "I honestly don’t know." She blinked up at him. "It’s probably a side effect of the treatment." "You were dead for ten years…" Compz suggested. "A lot can happen to a man in that time." "Thanks for that!" Blake grumbled, raising his hand to the target and straining with all his strength while nothing actually managed to happen. "These two can do it!" Blake mumbled, gesturing towards the two Federation drones. Without hesitation they both raised their arms and blue energy beams instantly crackled from their hands, instantly vaporising the holographic target. "According to the good Doctor you should have superior strength and mental abilities but we have yet to see those demonstrated either." Haldo told him, always enjoying the opportunity to annoy just about anyone. "Thank you." Blake glowered. "Have you managed to control the ship a little better yet?" "I think I have a plan to quieten the nightly problems that occur while you sleep but I will require your co-operation." "No problem." Blake shrugged, wiping his face with a holographic towel that simply materialised in his hand as he required it. "What do you need?" "I need you to close your eyes while I hit you round the head with a big stick!" Haldo smirked. "Seriously!" Blake hung his head in mild exasperation. "Seriously!" He nodded in enthusiastic agreement. "Well I also though we could re-route some of the control systems from the main system to the backup computer where your sick mind has less influence." Haldo smiled. "I like that plan better!" Girling told him as he lost the battle not to smile in amusement.. "I guess the command structure on this ship is going to be fairly relaxed then!" "Not at all, I demand the very highest loyalty!" Haldo said with a massive smile carving itself inexorably across his lips. "Except I’m in command…" Blake sighed. "Perhaps we could take turns, or maybe hold it up to a vote?" "Perhaps the force-fields around your cabin might fail." Blake suggested. "I suppose I see your point." He grumbled, pretending to be disappointed. "Seriously." Katherine butted in. "What are you going to do? You’re not just going to hand this ship over to Starfleet?" "I don’t have a lot of choice." Blake shrugged. "Half the ship isn’t even finished and none of us can find the shuttlebay, even the man who designed it. Of course I’ll only hand it over to someone I trust who will appreciate how dangerous it is." "Do you appreciate how dangerous it is?" Haldo asked, leaning up against the uneven engineering panels around the holodeck. "What choice do I have?" Blake asked, inviting suggestions. "Do we stay aboard, keep this ship out of harms way or fly it into a sun to destroy it?" "I don’t think this ship should ever have been made." Haldo began. "I also think that by the same logic you should still be dead and I should never have existed but we’re not considering killing ourselves." "You don’t think we should destroy it then?" Katherine asked. "I think we should consider that as an option." He replied thoughtfully. "If you really want my opinion then I believe we already have the right crew. We’re all responsible enough to appreciate what we have and none of us are interested in exploiting it." "You think we should stay on board?" Blake nodded in unconscious agreement. "I don’t think that we should allow another crew to take over!" The USS Olympus cleared her moorings as the Gargantuan vessel drifted from the orbiting platform above Mars. The Starfleet Command special investigation hangars were buried deep in the heart of the construction yards where they drew the least attention. The vessel was among the longest ever built by the Federation. She was a cutting edge, four nacelled design based around a Sovereign class saucer and secondary hull, arranged in such a way as to allow both the tactical ability of warp drive if the two sections separated. Her gleaming white hull glinted majestically as the sun licked over her streamlined edges and glowing engines. "The Violator." Admiral Bruss groaned as he reviewed the reports from the operations deck of his vessel. "It doesn’t get much worse that that!" Captain Reader agreed. "At least there’s still a slim chance that Girling will hand over the ship. We know the Violator has turned hostile." "A hostile vessel equipped with four photon launch tubes, one adaptive phaser canon, two pulse canons, a full type 10 phaser array, ablative self-regenerating hull armour and rotating regenerative shielding." The Admiral shook his head solemnly. "You forgot the cloaking device, mine launchers, quantum launch tubes and four insurgence tactical shuttles." Reader added. "That ship could tear us apart." The Admiral scowled. "We don’t know where he is." Reader reported, handing his old friend a padd with all the data he had. "It could be well outside of Federation space by now." He grunted. "It will be several days before we reach her last known whereabouts." Reader noted with a sigh. "There is someone who could get there more quickly." The Admiral began with a grin as a plan began to form. "Sir?" Reader asked, flashing his eyes over his pad. "There is nothing in range." "But there is someone who is faster!" He told him, his voice lowering to accentuate the air of mystery. "Girling?" He gasped. "You cannot be serious!" "Why not?" Admiral Bruss asked. "We can’t trust Girling." He insisted. "He’s a renegade." "He sent us all the data he accrued and a tentative offer to rendezvous and hand over the ship." Admiral Bruss continued, the finer points still working themselves out in his head. "He faced the Violator once before and disabled her without any intention of destroying it." He explained. "Even if everything goes wrong, he still has a head start and at least we’d know where to begin looking." "I’m receiving a message." Blake said suddenly as the computer systems spoke directly into his brain. "Very impressive." Compz grumbled as he worked on the engineering station at the bridge that kept sifting position as much to annoy him as for any other possible reason. "Why didn’t the computer tell you when the Bussard collectors accidentally sucked in crewman Tarrish?" "I guess the ship didn’t think it was important enough!" Blake smiled. "And I was told he fell in." "How is he, anyway?" Captain Graves asked. "Still very, very drunk!" Katherine Rogers told him flatly, beginning to grow accustomed to the Wanderer crews little idiosynchracies. "Which I gather he was when the accident happened." "The message!" Blake reminded them. "Starfleet intelligence is sending us a message." "It about time." Katherine smiled with a note of relief. "Call a general meeting!" Blake scowled back as the information was relayed directly to his mind. "Thanks for coming." Blake said as he stood at the head of the briefing table in the small conference room at the rear of the bridge. "Pleasure." Captain Graves assured him, smiling broadly as he glanced over to his less enthusiastic first officer. "I take it this has something to do with hearing back from Starfleet?" Haldo asked, interested in finding out what exactly was going on. "I’m afraid so." Blake assured him, his tone indicating that all was not well with his world. "What do Starfleet want us to do?" Katherine Rogers asked softly, fearing the worst which on a captured experimental prototype using stolen Borg technology could be very bad indeed. "Do they want us to hand over the ship?" "Apparently not." Blake shrugged, his eyebrows fluttering upwards as he sighed heavily. "Destroy it?" Dr. Jones suggested, clearly alarmed at the prospect. "Actually they want our help." Blake explained. "They have a mission for us." "For us?" Captain Graves smirked, assuming this was some kind of joke. "Do the know that our staff is made up of incompetent merchant crewmen, resurrected dead officers, turncoats, genetic experiments and Section 31 scientists?" Haldo asked intending the maximum amount of offence possible. "I’ve been fairly sketchy with most of the details of this ship." Blake began. "I didn’t let them know too much about her and I was vague about the crew also." "Do they know I’m aboard?" Dr. Jones asked, fidgeting nervously in his seat. "No." Blake replied firmly. "They know about myself and Ensign Rogers and that we escaped with a group of civilians. I thought it best not to volunteer any more information until we’re sure of who we’re dealing with." "We still don’t know how far Section 31 influence had permeated into Starfleets command structure." Haldo agreed. "Personally I don’t have a problem with it." Captain Graves said with an undisguised smirk from his enthusiasm at finally doing something exciting on a powerful ship rather than something terrifying on a dilapidated and barely space-worthy wreck. "I don’t think the crew would feel the same way." Commander Morrow interjected. "They’re not Starfleet, they didn’t sign up to be dragged into a battle." "I’m aware of this." Blake nodded as he sat down into the head seat at the spartan briefing room table. "I’ve reviewed the files, some of these people are very well qualified." "Three of my crewmen served with Starfleet before resigning their commissions due to injury." The Captain began. "Two more attended Starfleet Academy and simply chose not to accept a posting on a starship." "Two others were chucked out for disciplinary breaches." Haldo added. "And another is avoiding a warrant for his capture." "Nobody’s perfect." Blake Girling said with the ghost of a smile. "Will they do it with the least amount of fuss?" "Do what?" Haldo asked, reminding him that he had yet to reveal the details of the mission he was asking them to undertake. "The Violator has gone rogue." Blake said solemnly. "Captain Faruqui has disappeared." "They want us to find him and do what we can." Blake told them, leaning back into his chair to see the reactions. "This ship could tear him to pieces." Captain Graves smiled uneasily, wondering why the others had such pessimistic expressions. "We tricked them last time." Blake told him. "We used technology they didn’t know we had, the same thing we did with the Scarabs. This time they’ll be ready for us with an experienced and battle ready crew." "And we have an unfinished prototype with a crew of drunk misfits." Dr. Jones hung his head in his hands. "I’m still detecting sensor ghosts." Haldo told them. "I’ve managed to make some changes to the circuitry so Blake won’t have so much accidental influence over the ships systems but we’re a long way from being a match to a battle ship." "We only have to find her." Blake told him. "Starfleet command is sending a vessel to help us, we’re just saving them some time." "What do they think he’s trying to do?" Katherine asked. "They don’t know." He admitted. "His crew is used to having the mission largely kept from them so motivating them will be no problem." "Logically he’ll be looking for allies." Haldo told them. "His best hope now would be to align himself with the remnants of Section 31." "He wouldn’t do that?" Commander Morrow scoffed at the idea. "If he believes that that’s the best course of action to defend the federation then I believe he would." Katherine told him firmly. "He’s been through a lot." Blake said thoughtfully. "He sees Starfleet aligning themselves with us and this ship then he might just have a point." The Corinthian gently hung in space, her untarnished hull armour split across her body to show the intricate lacework of experimental equipment crammed haphazardly into every conceivable space. The hull had not been finished when the ship had initialised and large struts and load bearing joists were visible through the gaps left in her sleek hull. The twin nacelles jutted out proudly from her main sections, long glowing protrusions sweeping defiantly forwards utilising the new found strength gleaned from employing dangerous Borg inspired technology. Blake Girling sat at the centre chair on the gloomy bridge of his ship. He breathed out, his senses flooded with data, visions and feelings. The ship tingled, the hull felt like his own flesh for an instant, the sensors became his eyes and the power generation system pulsed with power as if pumping in his own chest. "Are you ok?" Katherine asked from behind him. "Sorry?" He turned to face her, not having heard what she’d said but her voice rousing him from his thoughts. "You look a little distracted." She smiled. "It’s a weird sensation." He said with a frown. "When I sit at the bridge I can feel the whole ship. It’s hard to describe." "Maybe one day all Starships will be controlled like this." She suggested with a supportive smile. "All Borg ships already are." He grumbled. "You have the appearance of a man with problems!" Graves noted, crossing his arms over his chest. "We need to take our stations." Blake stood up attempting to demonstrate some authority. "I’ll man the operations console?" Katherine suggested, glancing around to see where it had chosen to be today. "I can do that!" Commander Morrow suggested. "I’d like to help and I am qualified." "Fine with me." Blake smiled before turning to gesture towards the two other officers who had been raised from the dead by the same technology that resurrected him. "Helm and navigation are covered nicely." "Science station…" Blake offered hopefully. "I could really use you there." "Ok." She shrugged with some relief that she had some use. "Haldo?" He asked over the com channel that automatically opened. "How’s my engine room?" "Probably fine." He replied over the bridge speakers. "Maybe you could call me in a few seconds, I’m on the toilet." "Fair enough." He muttered as he turned to face Captain Graves. "I’ll just stay out of the way…" Graves shrugged. "Perfect." Blake smiled as he sat back down in his plush centre chair. "So what now?" Katherine asked as her console lit up for her. "Now we go to the last know coordinates of the Violator." He replied with a sigh, any better idea escaping him. "It will take at least twenty three hours at warp 9." Commander Morrow replied, glancing down at his terminal. "Then we better trim for Transwarp." Blake grinned. "Transwarp?" Captain Graves shrugged with a hint of suspicion. "Transwarp." Blake agreed, spinning round in the chair to face him. "Transwarp?" Katherine echoed. "How do we trim for Transwarp? How do we go to Transwarp?" "I’ll take care of it." Blake replied. The mechanical latticework of the slender nacelle pylons unlocked with a slight shudder that could be felt through the entire ship. The nacelles folded back into her slender tail section to fit neatly into the natural indents behind the mechanisms. Across the ship the exposed sections began to glow brightly in dull orange and a hotter, angrier deep red as the machinery reconfigured itself to emit the appropriate fields. "Has this ever been tested?" Graves asked hopefully, glancing around with obvious reservations. "On the Scarabs!" Blake confirmed. "They can manage a Transwarp pulse, it can typically only last for around half a second but is equal to 10 hours of warp 9." "But has it ever been tested on this ship?" Morrow asked with an impending sense of doom. "Not exactly." Blake replied, deliberately playing to their fears. "I think we can do a little better than half a second." "What should I look for?" Katherine asked, setting her controls to warn her of dangers to the ship. "Nacelles dropping off would be an early indication of trouble." Blake shrugged. "The stresses are enormous, that’s why the pylons are designed to retract." "The nacelles might be torn off?" Morrow reiterated, just to make sure he’d heard correctly. "For all I know, the whole ship could be torn apart." Blake commented without concern as the other officers set in the parameters for their test flight. "Haldo thinks we’ll be fine." "And you’re happy with that?" Captain Graves asked with a wince. "It’s good enough for me." Blake replied with a nod. "All systems report ready." Commander Morrow confirmed although he already knew that Blake would have had that information fed directly into his brain. The hull shuddered slightly as the systems came online. Deep within the intricate network of experimental equipment plumbed into every part of the ship things began to wink slowly to life. Pipes began to glow red and blue as energy and plasma cascaded into them at an exponential rate. The whole ship was slowly engulfed by a glowing blue haze that slowly began to wind gently around the ship, swallowing her into the depths of a growing transwarp conduit. Suddenly with a flash of searing light the ship was plunged into a massive arcing iris of eternal distance and time and it was swallowed in a blur of pseudo motion that stretched her beyond space. "I think I’m going to be sick!" Commander Morrow muttered, his eyes fixed on the three holographic viewers at the fore of the bridge that showed the snaking tunnel in front of them. "It’s not working right!" Blake grumbled from his central chair. "The conduit is stuttering." Katherine confirmed. "It’s going to disperse any second." "Will we make it to our target?" Graves asked, cowering from the rear of the bridge section. "Just about…" Morrow confirmed from his bank of equipment. "Haldo, why is the conduit not stable?" Blake called out, the com opening automatically. "It’s working normally." He replied. "Apparently it’s designed to do this." "What?" Katherine asked, her brow wrinkling curiously. "It’s experimental." He explained lazily. "They built it to err on the side of caution so the conduit is designed to fail when it reaches the point it’s going for." "Thanks for letting us know that." Blake grumbled while Captain Graves blustered about in obvious relief. "I thought you’d know that!" Haldo told him flatly while fiddling about down in his engineering section. "There’s meant to be thirty more crew linked to the computer system." He moaned. "I can’t do it all myself." "The conduit has failed." Katherine called out as the bridge display screens dulled as the brilliant lights of the transwarp tunnel split opened to spit them out back into normal space. Admiral Bruss sat alone at the rear briefing room at the aft of the spacious bridge. His head was rested in his upturned hands as he stared in silent contemplation at the stars as they melted by, stretched by the electromagnetic field of the warp engines. "Sir?" Joseph Reader called out from behind him. "At last." Admiral Bruss smiled heartily as he span his chair around to face his junior officer. "I received word from the renegade." "You went ahead?" Reader snapped in an accusing tone that belied his rank. "We’ll know at least if we can trust them!" The Admiral smiled, unconcerned at his old friends disagreement. "Have they agreed to help us?" Captain Reader mumbled, stepping forward to the seat. "Indeed they have." He grinned, flicking a padd to the other man. "They’ve already reached the last known coordinates of the Violator and have begun looking for a warp trail." "So far, so good." Reader grumbled as he reviewed the message. "how did they get there so fast?" "Interesting ship they have there…" The Admiral shrugged. "You really trust this man?" He asked, allowing his doubts to slip to the back of his mind. "He is a Starfleet officer." He began. " And he has advantages that we don’t." "Transwarp." Commander Morrow grumbled wearily. "It made my stomach turn." "That’s just your cowardice." Captain Graves assured him. "It would have been more pleasant if the ship hadn’t beamed my booze into the replicator." "I’m sure you can replicate a substitute." Katherine smiled. "Synthehol just won’t cut it." Commander Morrow told her flatly. "Well at least we can say that we’ve boldly been when no ship has been before." Blake said happily. "I’ve heard of several ships that have managed it." Morrow argued. "But, we’re still alive." Blake snapped moodily. "I’m almost sure of that." Katherine reported from her science station. "The ship held up well against the shearing forces. There was some minor buckling to the port nacelle arm but the nano-probes fixed it instantly." "I know." Blake flashed her a knowing smile. "I guess we better start hunting for the Violator." "Shall I start scanning for a warp-signature?" Ensign Rogers asked, pre-empting his agreement as her fingers began dancing over the only semi-familiar controls. "They would have decayed by now." Blake mused to himself. "There must be some other way…"
"I have an idea…" Captain Graves offered, rubbing his chin in anticipation of revealing his startling insight. "This is going to be good…" Commander Morrow moaned, almost afraid to listen further. "Please go on." Blake gestured for him to continue. "Why not…" He began, grinning inanely the whole time. "…why not ask Haldo?" "And I thought you were going to say something stupid." Winston mumbled. "It’s better than I hoped for actually." Katherine nodded in slight exasperation that had been tempered by two weeks of hearing much more stupid things than she had ever been previously prepared for. "He’s on his way." Captain Faruqui sat in silence in his private ready room at the edge of the Violator's bridge. His hands were knotted and supporting his head while myriad doubts clouded his thoughts and reasoning, a state of mind that was far from familiar to the seasoned officer. "How long has it been now?" His Commander asked, leaning back in her chair opposite him. "Nearly two days now we’ve been in here." He sighed. "Does the crew suspect anything?" "They’re used to following orders." She replied simply. "They believe our cover story that we’re simply out here hunting for the missing prototype and tracking down Section 31 escapees." "As intelligence operatives we were always slightly aloof from Star Fleet." He began thoughtfully, voicing his concerns. "Now we’re even more detached than ever. I’ve got a crew of 145 people and among them I feel utterly alone." "We still have a job to do." Commander Brown sneered with a voice dripping with resolve. "That will never change, just our understanding of it." "How are repairs coming?" Captain Faruqui mumbled almost to himself, grimacing in preparation for impending bad news. "Not quickly." The Commander sighed. "The nacelle is still heavily damaged. We’ve patched the power conduits but we can only run at warp 4 and even that only for a short while." "How long before we have full power restored?" He snorted disapprovingly as if blaming her for the slow progress. "I spoke with the chief engineer." She sighed. "He says that we will never restore power until we dock at a space-port for extensive repairs... The coils are shattered and the power lines can’t handle the flow from the injectors." "I see." He shook his head solemnly. "That just makes our lives harder." "The crew will continue to perform to their best!" She told him. "I agree." He conceded weakly, turning from her fixed gaze to the small window ahead. "How do you think our crew would feel about the course we’re taking if they knew what we were up to?" "The crew are accustomed to being kept largely in the dark." She told him flatly. "They’ll function normally I’m sure." "What about Clogg?" He sighed, leaning back heavily. "I think he suspects that something is wrong." She admitted petulantly. "He has been asking questions." "Apart from the fact that the computer assumes the ship to be perfect, it’s far and away the most sophisticated piece of equipment I’ve ever seen." Haldo began in the small plotting room at the rear of the bridge. "Any idea how we could use it to track the Violator?" Katherine asked, running her fingers idly over her control panel. "I have a plan…" He grinned, shooting a raised eyebrow at Blake Girling. "Go on." Girling suggested, his interest aroused. "I’ve been doing some work." Haldo began, rocking gently on his heels as he spoke. "The sensors on this ship are capable of tracking every particle of stellar matter for a light year of our position." "And the computer is capable of analysing their patterns using a sophisticated Borg analysis program." He agreed. "That’s incredible." She replied, her eyes narrowing to defensive slits as she pondered the implications. "That would mean what?" Blake asked, an idea already beginning to take shape. "It would mean that the effect of a ship passing and of going to warp would leave a wake that even days later would be subject to patterns that our computer can identify." Haldo grinned as his fingers danced over a control panel to set off a demonstration he had programmed in. Suddenly a glowing hologram appeared over the briefing table with a rendition of the Corinthian hovering at the edge while a path appeared from the extrapolated data. "How reliable is this?" Blake asked, a smile carving inexorably across his face. "That remains to be seen." Haldo admitted confidently. "The error rate is so low that I think we can assume it to be virtually infallible." "This would mean that the Violator headed at low warp into the Goron sector?" Katherine interjected. "Nothing much there." Blake agreed. "No inhabited worlds." "There is a class G nebula with sporadic plasma discharges." Haldo shrugged. "You’d be stupid to take a ship in there." "Perfect place to hide." Blake sneered. "The Violator is an exceptional vessel." Katherine added. "She could weather those storms for quite some time." "Set a course." Blake nodded. "Shall I arrange to rendezvous with Starfleet at the Nebula?" Katherine asked. "Of course." Blake grinned. "If we pull this off they might finally let me wear a uniform again." The nebula was a dense orange mass throbbing with plasma that occasionally arced bolts of fiery yellow energy through the misty tendrils of ionised gas. The Corinthian gingerly edged forward into the eerily glowing haze that could hide a ship both visually and from her voracious sensors. "I’m not picking up anything…" Compz reported glibly, leaning nonchalantly on the science station readout. "What about the gas particles, don’t their positions give you any ideas?" Blake asked hopefully, glaring at the throbbing cloud through the main viewer assembly. "The cloud is too dense." Haldo admitted with a shrug. "They’re just crashing into each other, the computer couldn’t make sense of it." "So what now?" Katherine asked, shooting a glance around the bridge upon which an uneasy silence had fallen. "We push on." Blake replied with a firm confidence. "We find that damn ship!" "The Starfleet support vessel will be with us in less than an hour." Katherine told him. "They’re at maximum warp." "I want their position before they arrive." He said softly. "I want to prove this vessel." "Prove it?" Compz asked with interest. "I want to show the Federation what she can do." He smiled. "The Borg technology might not have been the best idea in the world but we have it now…we might as well use it." "You mean prove it in combat?" Dr. Jones grimaced, his stomach churning at the thought of more space battles on board a ship that had more holes in it than the logic behind the Ferengi code of conduct. "You built her." Blake reminded the nervous scientist. "She has more weapons than the average Klingon bathroom." "You want to prove her?" Compz jumped up from his terminal. "I’ve just detected the Violator and she’s closing on our position. It looks like you’re going to get your chance." Goruss Clogg stared at the image of the Corinthian as she hung at the edge of the nebula, gently drifting forwards into the first faint tendrils that marked the perimeter. He waited for the Violator computer to finish computing the information from the targeting scanners. "I have a target lock." He reported calmly. "We will be in weapons range in three minutes." "Excellent." Captain Faruqui grinned. "Charge Phasers and load all torpedo tubes." "Sir." Clogg leant forward from his tactical station. "They didn’t fire a weapon last time we faced them, perhaps we should try contacting them first." "We will do this my way, Mr. Clogg." The Captain sneered icily. "If you don’t feel able to operate as part of my crew then I can easily replace you." "Yes sir." He hung his head at the minor reprimand. "I would also like to remind you that weapons and shields are at less than 60% of normal, I don’t see how we can pose much of a threat to her." "We’re expecting company." Faruqui smiled cruelly. "We have a little trap prepared for Blake Girling." "Company?" Clogg started. "I’m detecting no other ships." "Just do your job." He hissed his acid reply. "They’re locking weapons." Commander Morrow warned. "Shields are up." Blake replied, standing up and stepping forward to the viewer. "I guess diplomacy is out of the question." "Are you ready to fight?" Katharine asked. "It looks like you might have to." "I certainly don’t want to." He sighed. "That’s a Starfleet crew over there. He could have told them anything about us." "The weapons are remarkably sophisticated." Haldo began as he worked at his console. "I can probably adapt them to disable their shields." "I have a better idea." He said with a sudden smile as inspiration grabbed him. "We only have to keep them busy until Starfleet command arrives. No matter what he’s told them, they won’t allow him to fire on another Starfleet vessel." "We can hide in the Nebula." Haldo grinned back. "We can take the occasional pot-shot at them to keep them interested in us. 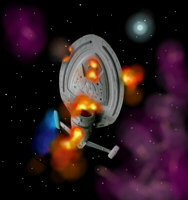 I can set the phaser cannon to emit a wide beam that will scorch their shields but cause no real damage." "Done." Haldo shrugged. "That was the easy part…"
"Great…" Blake rubbed his chin thoughtfully while he watched the image of the Violator approaching. "Something wrong?" Katherine asked, watching his expression as she sidled up beside him. "Faruqui is arrogant." Blake replied thoughtfully. "This is suicide though." "What do you mean?" Captain Graves asked, mostly to include himself in the activity as he was slowly swept up in the excitement. "Haldo?" He spun to face his engineer. "How much damage did we do to them last time? How well could they have recovered?" "It looked bad." Compz shrugged. "The nacelle took severe damage, they can’t be running at full power." "This is wrong." Blake's eyes narrowed defensively as he turned back to the main viewer. "It is a bold move." Katherine agreed. "Those sensor echoes?" Blake snapped suddenly. "Did you set the computer to ignore them?" "Yes of course." Haldo replied, beginning to realise what was troubling Blake. "I’ll scan for them now." "What is going on?" Captain Graves glanced rapidly from face to face with growing concern. "There might be a cloaked vessel tracking us." Blake told him as he stepped close to Haldo, waiting for the bad news. "But he detected our warp signature." He reminded them. "No other ship has a signal like ours. "A Federation type trail with an overlay of Borg technology?" Haldo began as he scanned for the echo. "One other ship might appear as us if it was following our movements closely." "A Scarab!" Commander Morrow groaned. The Corinthian banked suddenly and lunged head first into the throbbing nebula at maximum impulse speed. In her wake a crack of plasma arced behind her tail as the Violator turned to follow her deeper into the clouds glowing depths. "I’m scanning the particle wake." Haldo reported. "There’s way too much activity but I think it’s safe to assume a cloaked vessel is following us in." "And we have no rear weapons." Commander Morrow sighed. "And we can’t run at Transwarp because a Scarab can keep up." "We can’t trim for a Transwarp jump anyway while we’re at these speeds." Blake muttered a reply. "I have an idea." Haldo jumped up from his console. "This wouldn’t work on any other ship…"
"Go on…" Blake told him with enthusiastic expectation. "We can beam through our shields and theirs won’t be up while they’re running cloaked." Haldo reminded him. "We could beam out torpedos and lay them like mines to detonate in our wake." "Can you guess the target distance?" 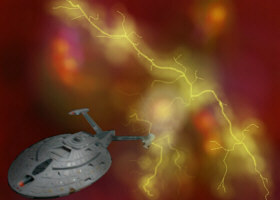 Blake grinned as his mind began interfacing with the ships systems and loading Photon torpedoes with time delay fuses. "I think so." Haldo grinned back. "I’ve locked in my estimate." The Corinthian sped through the broiling clouds as fast as she could go as the tiny black casings materialised behind her in a sparkling blue haze. They quickly erupted in her wake sending a fiery red plume of destructive energy cascading from them into whatever was following her. With a flicker the graviton field collapsed and the light rippled away to reveal the squat appearance of a Scarab class attack ship. "It’s a Scarab all right." Haldo confirmed. "We hurt it, the cloaking device is down and his shields are coming up but they’re fluctuating." "Let’s hope we damaged the weapons systems too." Blake replied with a hopeful note. "I’m bringing her round to let our weapons come to bear. Lock on the phaser cannon and set it to do as much damage as you possibly can." "The Violator is closing." Commander Morrow warned. "She’s slow but those weapons are still locked onto us." "We need to disable the Scarab first." Blake added rhetorically. "Starfleet should be arriving soon. We could sure use them!" "I’ve locked the weapons to the main generator crystal." Haldo reported. "A hit there should knock the Scarab out of the fight." "Firing!" Blake nodded as the ship followed his thoughts. A beam of orange light erupted from the massive weapon mounted in the alcove of her nose. The energy connected directly with the Scarab at her tail in an engineering system where a dome glowed a dull green. The shields rippled and crackled as they deflected the incoming beam. "Their shields are up." Winston Morrow breathed heavily. "We hurt them but we didn’t knock out their engines." "We’ll make a run directly at the Violator." Blake told them. "If they’re working together then they won’t fire on us until we’re clear." "But the Violator has guns too." Captain Graves cried out. "They’ll be too busy!" Blake assured him. The Corinthian spiralled through the cloud directly into the gaping weapons of the heavy Starfleet intelligence cruiser. She fired two low yield photon torpedos toward the ship and then banked hard away and vanished behind her own cloaking device. The photons erupted in a brilliant blast of light that did little more than temporarily blind the Violator's sensors. "We’re alive?" Dr. Jones said quietly from the rear of the large bridge. "Just barely." Haldo replied softly, glancing around at the expressions that ranged from angry to terrified. "I think we can safely assume that Faruqui has aligned himself with Section 31." Blake Girling spoke with a hint of regret. "What do we do now?" Katherine asked, stepping forward. "We can’t just hide here, the Scarab will find us eventually." "Starfleet will be here soon." He shrugged. "I figure that when they arrive we decloak and lure them out." "If they’ll follow us…" Haldo suggested. "At least it will be a fair fight." He retorted, attempting to sound more confident than he felt. The Olympic slipped out of warp in a blur of motion that cracked space open with a plume of white light. "We’ve arrived at the coordinates." Captain Reader spoke as the Admiral came from the briefing room where he’d been working alone. "Excellent." He replied, his interest more attracted to the sight of the pulsating nebula that hung in space like a dirty stain. "I don’t get out here often enough." "Space?" Reader asked with a knowing smile. "I know just what you mean." "Any sign of our friends?" The Admiral turned to the officer at the operations controls. "The nebula is confusing our sensors. I’m attempting to compensate." The young man replied efficiently. "The renegade arrived nearly an hour ago." Reader reminded him. "I hope there’s something more in that cloud than debris." "Why do you hate this man so much?" The Admiral smirked, his face twitching into a lacklustre expression of amusement. "I don’t know him, sir." The Captain retorted. "I just don’t feel comfortable with him out there. I like to trust people and trust is earned." "When he disable two Scarabs and the Violator he earned my respect." Admiral Bruss began, rocking slightly on his heels as his hands clasped behind his back. "He also sent back all the data he could and rescued the workers from the asteroid." "I know that sir." Captain Reader grumbled. "Then maybe we should give the man a chance, meet him before you judge him." "Sir." The operations chief cut in. "I’m detecting a ship heading this way at full impulse." The Corinthian blasted out of the cloud, closely pursued by the damaged Scarab and the limping but still dangerous Violator. "Well they are following us." Haldo confirmed unhappily. "Straight into the waiting arms of the Olympus!" Commander Morrow added with a hopeful smile as the ship's registry and data appeared in the Corinthian's massive archive. "Impressive ship." "Let’s hope so!" Blake rung his hands together expectantly as the ship grew larger on the viewer and the approaching vessels behind grew closer to them. The Corinthian slowed to a full stop and turned to face the other ships. The Scarab slowed and remained fixed on them while the Violator held position. "I think your concerns are over!" Admiral Taloc Bruss told his old friend as the two entered the Captain's ready room. "About Blake refusing to hand over the prototype." He added. "I think we’ve left him no choice." "Sir?" Reader blustered slightly. "What the hell is going on?" "I don’t believe in taking chances." He told him flatly, his amusement vanishing to be replaced by a rigid fixation on his mission and a ruthless determination to see it through. "We’re going to take the ship and place Mr. Girling in custody." "Sir?" Reader rubbed his forehead in exasperation. "That’s a Scarab out there." "Sir, that’s a Scarab!" Reader began. "That ship belongs to Section 31." "Reader…" He began in reply. "That ship belongs to me!" "And the Violator?" Reader blustered again in confusion. "She is operating under my direct instructions in order to capture the prototype." He replied simply as if explanation was erroneous. "Sir." Reader began. "There is a Section 31 battleship and a rogue heavy cruiser out there. How can they be under your direct command." "I would have thought that that was obvious!" "We’re surrounded!" Blake groaned, hanging his head. "All three ships have weapons locked onto us." Morrow added solemnly. "Can we take it if they open fire on us?" Blake turned to Dr. Jones. "I doubt it." He sighed wearily. "There’s no way to tell of course but I can’t see us lasting long against all three of them." "Haldo?" He spun to the engineer whose face was locked in a thoughtful expression of hopelessness. "I don’t see what we can do." He added. "I’m receiving a message…" Blake told them all. "Go on." Katherine said, stepping up beside him. "They’re ordering us to drop shields and hand over the vessel." He began as the message ran through his mind. "They’re asking for Haldo, Katherine and myself to beam to the Olympic's main shuttlebay for arrest." "The rest of us?" Dr. Jones asked as a trickle of sweat ran down his head. "I don’t know." He admitted. "You’ll be ok." Haldo grumbled. "You’re one of them." "Not any more I’m not." He snapped back, taking Haldo slightly off guard. "I had better beam over." Blake shrugged. "Maybe we can trick our way out of this yet." "Blake!" Dr. Jones called out. Blake turned to face him and raised his eyebrows expectantly. "Don’t forget that they don’t know what you or this ship is capable of!" The three materialised in a shimmering beam of incandescent blue light in the centre of a well lit shuttlebay. The auxiliary craft were missing, all having been lowered into the hanger bays beneath and the large hall was sealed with powerful force-fields that crackled to life as soon as the transporter beam had died away. The main door opened and a small group headed for them across the white and grey floor plating, their footsteps echoing around the bay. Blake stepped forward and watched as the Admiral approached, flanked by two security officers armed with personal phasers. Behind him was Captain Faruqui and Captain Reader. "Welcome to the Olympic." The Admiral called out. "And thank you for delivering our ship back to us." "Any time." Blake sneered his reply. "You can’t scan him." Captain Faruqui called out. "His implants black our tricorders." "I know." The Admiral nodded. "I know all about him." "No need to ask how far Section 31 influence has eaten into Starfleet!" Haldo said loudly. "There is no Section 31!" The Admiral replied. "There is just Starfleet. Sometimes we have to bend the rules to get the job done and that requires a touch more bravery than we expect from our standard officers." "Bravery?" Katherine called out. "You call this bravery?" "There are many kinds of courage." The Admiral continued with an accusing edge. "There are many kinds of deceit." Blake told him angrily as he battled to control his temper. "The worst kind is when you lie to yourself." "Order your ship to lower her shield so we can transport your crew to our brig." The Admiral told him, ignoring his comments. "And then what?" Haldo inquired. "Hand over the ship to you?" "I don’t want you to hand it over." He smiled disarmingly. "I just want you to give it back!" The Admiral raised his hand to Captain Faruqui who grinned maniacally as he pressed his com-badge. "Faruqui to Clogg." He began. "Clogg here." Came the electronic reply. "Lock pulse phaser and Quantum torpedoes on the Corinthian and prepare for continuous fire on my signal." He ordered. "Sir?" Clogg cried out over the channel. "There are still people aboard." "Do it!" Faruqui yelled furiously. "And that’s just the beginning." The Admiral flashed him an amused grin. "Clearly you’ve aroused this man's passion… Perhaps I should hand you over to him." Blake closed his eyes and focused his concentration. He felt his way through the Corinthian's archives hoping to find some way out of their predicament in the massive records and files. "Sir, this is not right." Captain Reader stepped forward. "Be quiet, Joe." The Admiral dismissed him with a wave. "Sir." He began, unperturbed. "Faruqui should be facing charges and I cannot believe you are threatening innocent people's lives." "What did you expect?" Haldo sneered. "This is what Section 31 is all about." "I’m not part of Section 31." Reader snapped. "Nobody here is…"
"Well, you’re stupid or a liar!" Haldo retorted. "Not sure what’s worse." "This is your ship?" Blake snapped, stepping forwards slightly which aroused some interest from the two security guards. "Of course." Reader replied. "But I’m under the command of the Admiral." Blake stepped forwards, his anger building to the point where he could barely contain himself. "Blake…No!" Katherine called out to him but her words fell on deaf ears. He stepped forwards to where the two guards were already in the middle of drawing their weapons. He raised his palm and a blue flash cascaded out as a brilliant blue beam fired out into the Admirals chest that lifted him from his feet and threw his across the polished white floor. He yelled in pain and surprise as the energy lashed out at him and he crumpled into a dishevelled heap with a faint wisp of black smoke gently wafting from his scarred uniform . One of the guards froze in surprise, simply gazing in stunned amazement but the other fired a beam of sparkling orange energy at him. A force field instantly appeared to deflect the energy and Blake simply stood there with his arms crossed and a frown carved across his face. "So you can do it?" Haldo laughed in relief. "Couldn’t have come at a better time!" "Now you’re in charge…" Blake growled at Reader, his heart still pounding from the adrenaline surging away inside him. "Er…" Reader mumbled, his attention divided between Blake and the fallen form of the Admiral. "Is he just stunned?" "I have no idea." Blake admitted, hardly caring. "All right…" Reader held up his hands for the two security officers to stand down. "Put the phasers away, lower the force fields." "What the hell are you doing?" Faruqui yelled accusingly. "These people are dangerous." "This is my ship…" Reader told him. "And you’re under arrest!" "Me?" Faruqui cried out. "You can’t arrest me." "What about the Scarab?" Haldo reminded them. "It’s still out there." "Faruqui to Violator." He cried out, pressing his Comm badge. "Destroy the Corinthian…"
"No!" Blake shouted lunging forwards. He grabbed the wayward Captain and pressed on his badge. "Do not open fire!" Clogg glanced at the Commander as she jumped up from the centre chair. She spun around accusingly, glaring at him as he waited. His morality froze his hand above the controls. "I can’t." He said simply, stepping back from the controls. "I’ll do it…" She sneered, pulling him forcibly out of the way. "Security… Arrest this man!" "This is Blake Girling." A voice called out over the ships speakers. "Captain Faruqui has been arrested by Starfleet command and a photon torpedo has been beamed into your weapon launch tubes. Any attempt to fire will result in the destruction of the Violator. Stand down and prepare to hand over the vessel." "He’s bluffing." She called out. "Our shields are up." "That doesn’t matter." Goruss cried back. He spun around the bridge where the officers were stepping back from their controls, bewildered by the turn of events. "She’s locked the weapons to fire!" He told them. "Abandon ship." Suddenly the Violator Quantum torpedo launcher vanished in a blaze of brilliant released energy. The torpedo yield was held in by a magnetic shield to focus the blast on as small an area as possible but the secondary shock wave ripped outwards from the launch barrel tearing into the hull. The entire power grid received a jolt of energy from the blast and overloaded blowing out power conduits all over the ship. "I’ve penetrated the shields." Blake told them. "I’m beaming people off the ship now but she’s going to blow any second." "I don’t understand…" Reader rubbed his head in dismay. "What the hell is going on?" "He’s linked to the Corinthian." Haldo explained. "His mind is a part of the computer now." "The Violator is coming apart." Blake warned. "Get this ship out of range. We’re going back to the Corinthian." Suddenly the three of them vanished in a flickering transporter beam. "We’re back!" Haldo cried out triumphantly around the bridge to the crew who were staring fixedly at the image of the Violator as the hull ruptured in a series of powerful blasts. "Negotiations didn’t go exactly as planned." Blake added. "How many left on board?" "Just the bridge crew!" Haldo replied as he jumped into his seat. "Bring them here." Blake snapped. "We need to get after that Scarab before it turns on the Olympic." "Got them!" Haldo told him. "I put them in the holodeck in a simulation of a brick dungeon and locked out the commands." "Fire on the Scarab!" Blake told them. "Full power to the cannon." 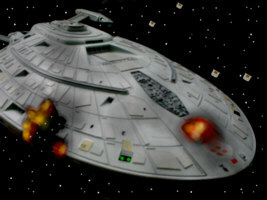 A blast of energy surged into the small attack ship and she banked away as her shields struggled to deflect the energy. A second beam tore into her from the Olympic from her upper main phaser bank as the huge ship came to the attack. 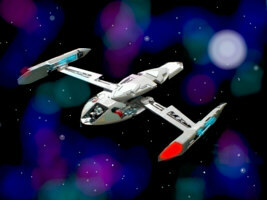 Her nacelle wings folded out and blazed as she retreated at maximum warp. "She’s pulling away." Morrow cried out. "And we better go. The Violator is going critical." "Trim for Transwarp." Blake ordered although the ship had already begun to do it. "Engage!" Reader was clearly impressed as he gazed around the bridge of the Corinthian. "It’s an impressive ship." Haldo told him. "It’s still growing. The replicator web is building new parts every day, she’s literally evolving." "I had no idea." Captain Reader replied with a polite smile. "It’s not as easy as just handing her over." Blake said, slightly apologetically. "She’s bonded to me, I don’t know how so I wouldn’t know how to reverse it." "There’s so much we don’t know." Dr. Jones added. "My opinion about you has changed." Reader smiled. "And I had no idea that Section 31 influence had extended so far into Starfleet command." "We knew." Haldo patted him on the back. "Next time you can just ask us!" "I’m incredibly dubious about bringing this ship back to Starfleet command until we’ve rooted out all the Section 31 people." Reader said thoughtfully. "I couldn’t agree more." Blake nodded. "I do have a proposition." Reader turned to Blake. "I’ve cleared this proposal with a few high ranking officers that I do implicitly trust." "I thought you trusted Bruss!" Haldo goaded him. "Well I’m not taking any chances this time." He replied awkwardly. "I’m listening." Blake cocked his head to one side slightly, his interest piqued. "We want you to work with us to go after Section 31." Reader began. "I can extend any support you need from Starfleet and you’ll still be bound by rules and regulations but you will only have contact with me." "Sounds good to me." Katherine grinned widely. "Blake is to be offered the rank of Captain and your whole crew is to be offered Starfleet commissions." Reader smiled, enjoying the role of messenger when the news was as welcome as it was. "I’ll have to discuss it individually with the crew." Blake replied, rubbing his chin thoughtfully. "I can tell you that the idea appeals to me." "Great!" Reader beamed. "I’ll take the Violator bridge crew off your hands and leave you to mull the idea over." "Fine!" Blake beamed back, reaching out his hand to shake the other mans. "There is just one thing!" Katherine stepped forward, rocking on her heels. "Go on." Captain Reader raised his eyebrows expectantly. "I’ve spoken with the people we beamed aboard." She said. "There is one person we should invite to join our crew." "He’s a good officer and we could use a security expert." Blake nodded in agreement. "I’ve heard only good things about him." "I’ll see what I can arrange." Reader nodded. "Until then, I’ll leave you to upgrade your systems until I can find you a mission." "Thanks." Blake replied. "Thanks for everything."